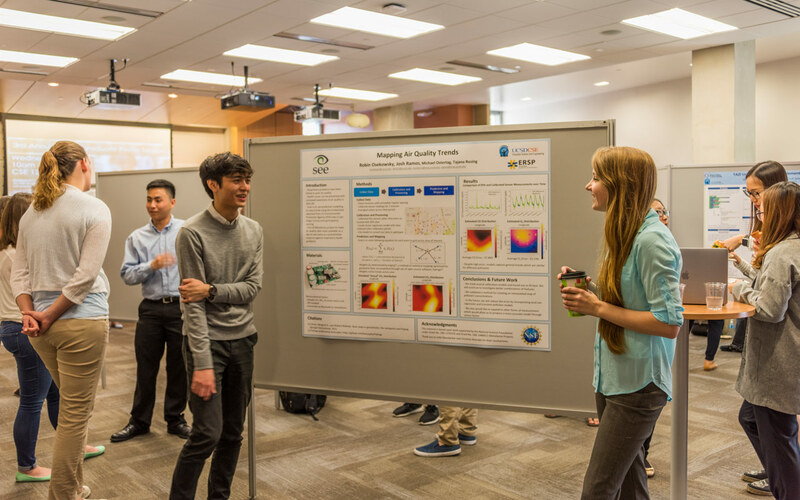 UC San Diego students participating in the Early Research Scholars Program share the results of their apprenticeships with peers, faculty and staff. Since its inception in 2014, ERSP has provided research opportunities for 138 students, including 96 female or non-binary students and 26 students from underrepresented racial and ethnic groups. On average, students who participate in ERSP have higher overall grade point averages than those who do not. ERSP uses a team-based approach to make computer science research less intimidating. Second-year student teams complete a full year apprenticeship, in which they take an introductory computer science research course; observe a research group’s activities; and then propose and complete an independent project with guidance from a team of mentors. Past projects range from using machine learning techniques to identify the perfect workout to underwater systems that estimate ocean depth. Individual institutions and departments can tailor this original model so it has the greatest impact on their students. “Our end goal is to create a flexible and easy-to-implement program that can be initiated by any university with a significant research program. The rewards include not just retaining diverse students, but also increasing the number of undergraduate students who are trained in research methods,” Alvarado explained. For more information on the Early Research Scholars Program, visit: http://ersp.ucsd.edu/.